The Tennant M30 Scrubber sweeper is probably the most productive piece of equipment available if you have very large areas to keep clean. 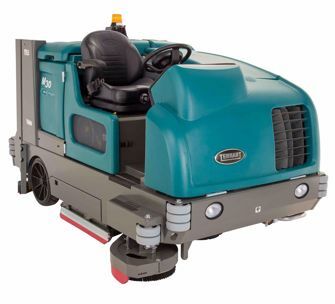 The Tennant M30 was designed for very large sweeping and scrubbing applications like parking garages, vast distribution centers and manufacturing plants. This versatile machine can sweep and scrub in a single pass. It can also be run as a dry sweeper when necessary. We consider the M30 to be the ultimate machine for cleaning contractors that tackle a variety of large scrub out tasks. There are a variety of options that will help get the job done in different applications. An integral 2200 PSI power washer option allows your operator to quickly clean walls, corners and other tight areas. The off aisle power wand option will vacuum up the water where the machine can’t go. The Tennant M30 even offers and enclosed cab with heat and cooling to keep your operator comfortable in any environment. Productivity is taken to a new level with the M30 Scrubber Sweeper. The machine scrubs up to a 62” path with the optional scrubbing side brush. The large 75 gallon solution tanks along with Tennant’s water saving options like “ES” recycling system for extended scrubbing will keep your operator cleaning instead of dumping and refilling. The “EcH2o” electrically converted water option virtually eliminates the need for detergents in some applications. “EcH20” also reduces water usage by about 70% saving time and money. Variable dump height up to 60"